Cook like an Italian at Mia Francesca’s Cooking Class August 14th - San Diego Dining Dish! Mia Francesca offers fans the opportunity to bring the restaurant’s award-winning Italian flavors back home to their kitchens with a special cooking class on Wednesday, August 14 at 6 p.m. Chef de Cuisine Woody Benitez will lead an intimately sized group in whipping up four courses of the rustic cuisine that Mia Francesca serves daily. The class begins with a complimentary glass of wine and a first course of string bean salad and risotto funghi. Students will then move on to Pasta Melanzane and Salmone alla Fresca. A Mascarpone and Caramel fourth course will finish things off complemented by a glass of Mia Francesca’s signature limoncello cocktail. The cooking class is $60 per person and includes all recipes. Call (858) 519-5055. to reserve your spot now. Mia Francesca offers famous rustic, Italian cuisine, created by acclaimed restaurateur Scott Harris, friendly service and fair prices. The restaurant features a large open patio, indoor trattoria style dining, and a 50 person private dining room. Chef Woody Benitez leads the kitchen, providing Francesca's classic fare of zesty, earthy cuisine of Rome and the surrounding areas of Tuscany, Umbria, and Lazio. 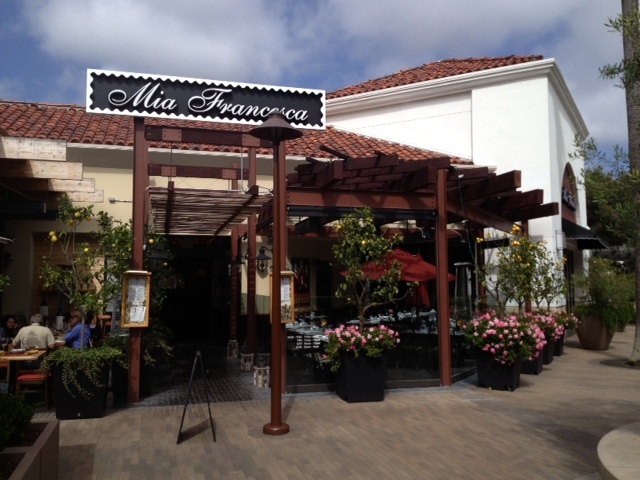 Mia Francesca is located at 12955 El Camino Real, San Diego, CA 92130 in the Del Mar Highlands Town Center and the telephone number is (858) 519-5055. Connect with Mia Francesca on Facebook, Twitter and Instagram or visit www.miafrancesca.com.